The bakery still sells a small selection of Georgian products and bread to go. The adjoining dining room is done in a simple, rustic style. Love the fake stone wallpaper! Not surprisingly for the neighborhood, the clientele is mostly Georgian and Russian. The menu is 100% Georgian and not overly long. 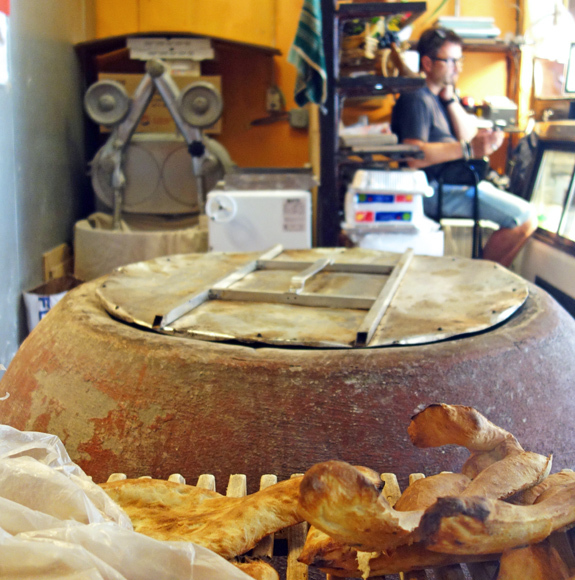 Of particular interest is the vegetarian section, which adds variety to all the traditional dishes that are already vegetarian — Georgian food definitely provides exciting alternatives for people who don’t eat meat or fish. 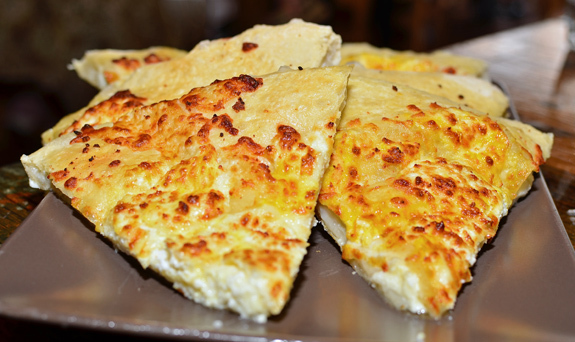 There’s also half a page dedicated to khachapuri, including a gvezeli that I’ve never had in my life. Moving on to the khachapuri. The menu mentioned that they’re made with farmers cheese and mozzarella, but I don’t know whether this was meant literally or just as approximate synonyms of Imeretian cheese and sulguni, for ignorant Westerners. Maybe I had overly high expectations, but I was disappointed in a couple of ways. Firstly, not all the types listed on the menu were available on any of my three visits. I never got to try the achma, for example. And one Sunday evening after a weekend out of town, I sat through hours of traffic jams in the hope of have an Adjaran khachapuri for dinner, only to be told that they didn’t have any that day. Secondly, the types I did try weren’t bad, but not always as good as I expected them to be. Take the Imeretian khachapuri. It wasn’t browned enough to my taste, possibly because it was cooked in an oven that wasn’t very hot. Sure, there are nearly as many ways to make khachapuri as there are inhabitants in Georgia, and many of them are made in sluggish Soviet ovens, but I still think that making a pale, less flavored khachapuri is a bummer for a Georgian bakery, or any bakery, really — the Maillard reactions play a major role in bread-making. Then there was the dough, which made me think of the standard pizza dough you find at a by-the-slice joint [disclaimer: I’m not saying that’s what it was!]. It also lacked salt. The slightly salty cheese, most likely Georgian (I wanna say sulguni), did taste good. Since they do still sell Imeretian khachapuri to go at the counter, I wonder if the batch we were served was made ahead and simply reheated — the wait also seemed to be slightly shorter than for the other types. 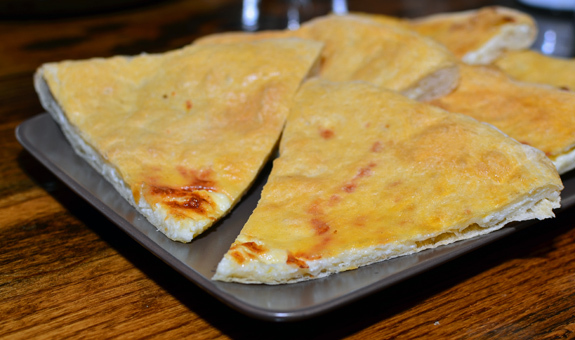 The Mingrelian khachapuri fared better, partly because (I suspect) this one was made to order. Or maybe it just got more oven time for the extra cheese, as I think there was more cheese inside (the same sulguni-like mixture). The top was generously covered with something like Imeretian cheese. Even though the bread suffered from the same cooking problem as its Imeretian cousin above, the additional golden-brown cheese on top made this one much more satisfying. 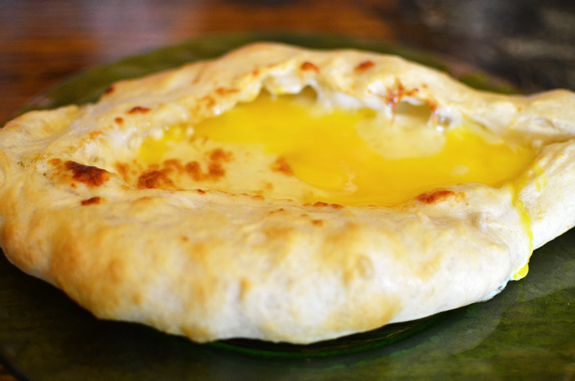 The Adjaran khachapuri followed the same trend. This behemoth, large enough for two people as a main course, was most certainly made to order, from scratch, with lots of cheese and the right amount of salt for the best flavor — a good khachapuri must be salty. The cheese mixture hit the right texture too, somewhere between soft and stringy, something usually achieved by mixing Imeretian cheese and sulguni (that’s my guess, anyway). Supposedly it came with not one, but two eggs on top (the yolks on ours were already broken). I don’t think I saw any butter on top, though it may just have melted, and believe me, this dish is already rich enough! The bread dough was the same dough with the same problems as above, but overall this version definitely satisfied my craving. 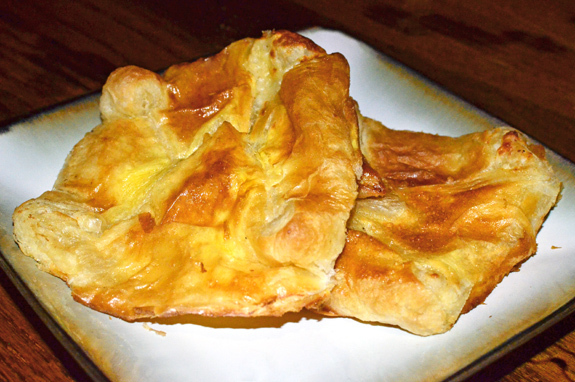 We also tried the penovani khachapuri, made with puff pastry, available in small or large sizes. This one was made ahead too, and ours arrived barely re-heated. Same cheese mixture, though with slightly less salt (and therefore flavor) in this particular batch. The puff pastry was fine but not super fluffy; most likely the commercial, butter-free variety. Come on, wouldn’t it be great to have a buttery, flaky pastry instead? Moving on to the appetizer section. The lobio came in two versions, cold and hot. 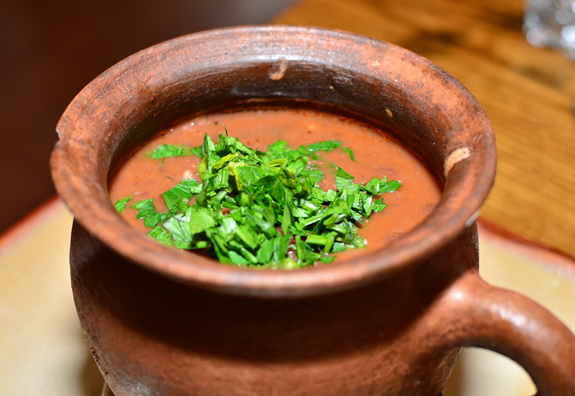 The cold lobio, a thick mixture containing red beans, onions, walnut paste, and some herbs, tasted very good, but perhaps lacked depth of flavor. Since it’s cold, it could use some more seasoning and spices. 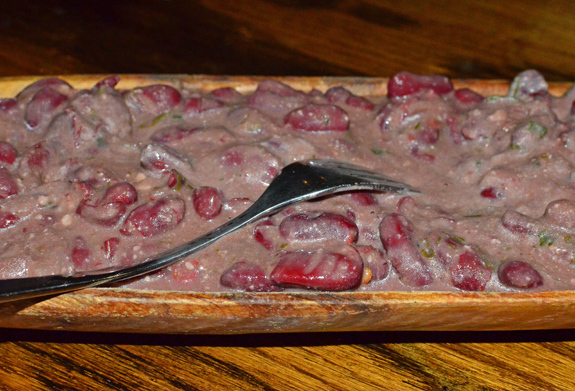 The hot version, served in a traditional clay pot, was more like a red bean stew. I believe the ingredients may have been slightly different: no walnut, but tomatoes, more spices, and fresh cilantro on top. Very good. Our meal was already rich enough, but I bet a generous slice of butter in there would have made it even better! 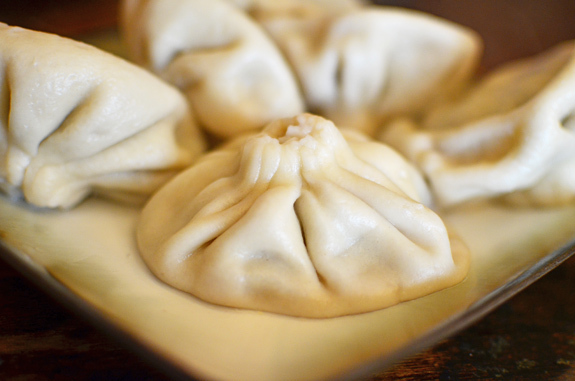 The khinkali, colorfully described on the menu as “boiled hand-rolled dough bundles filled with juicy delicious ground beef seasoned with Georgian herbs”, turned out just OK. The dough bundles were quite thick indeed (some might say it’s authentic), and the meat patties inside were indeed juicy. But the patties contained sooooo much cilantro that they didn’t taste of anything else. The herb completely masked even the meat’s own flavor. Whether this too can be considered authentic or not, I clearly remember eating khinkali in Tbilisi that didn’t have that problem. 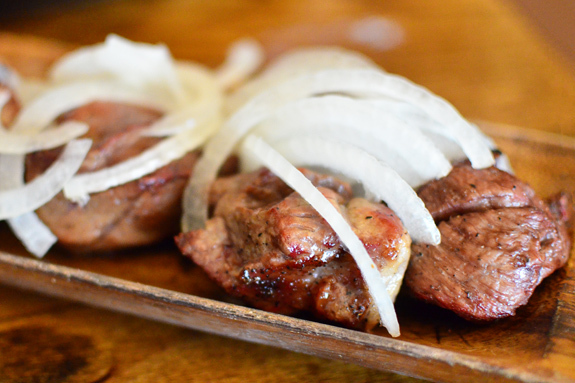 In the kebab department, the mtsvadi (“choice of lamb or pork or chicken”) was your traditional Georgian skewered meat cooked on charcoals. The juicy and slightly fatty lamb came medium-rare as ordered, and the onion on top was thinly sliced, so kudos there. However, the meat could have been more tender, and I doubt it was marinated or seasoned with anything more than salt. The menu said it came with a kind of tomato sauce, but either I or the waiter forgot about it. The kababi, Georgia’s version of lyulya-kebabs made with pork and beef, did come with the tomato sauce, and was very successful. 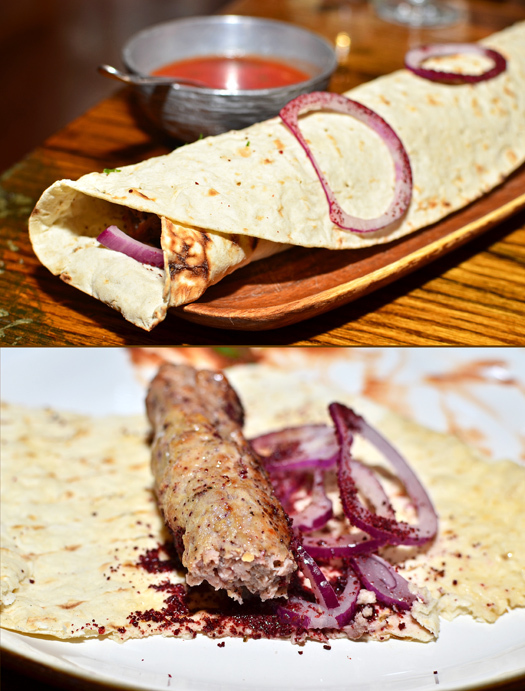 It was wrapped in lavash, with thin slices of onion seasoned with what I thought was sumac but seems to be barberry according to the menu. The meat was served well done (to be expected with the pork) but not overcooked or dry. The inside wasn’t too compact, and it was 100% meat from what I can tell (no bread or other fillers). The somewhat thin spicy tomato sauce was good but not necessary. Last and least, the shkmeruli. This chicken stew consisted of a whole chicken cut into pieces, served in sauce made with milk, cilantro, salt (quite a lot of it), and garlic. Tons and tons of undercooked garlic. Sure, the chicken was very tender, but the amount of garlic masked everything else, and made the dish pretty much inedible. 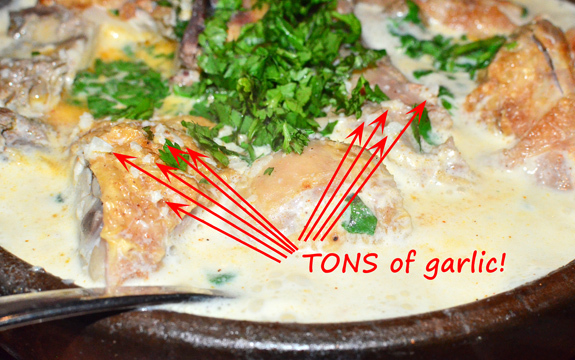 Yes, the menu said “simmered in a garlic sauce”, and did I hesitate, knowing it wasn’t gonna be subtle. Still, this was ridiculous. I don’t even remember eating garlic in any memorable amount in Georgia! (Slight digression for the overwhelming number of people who think that Italian cuisine equals garlic, and have most likely never set foot in the Peninsula: where do you see Italy mentioned in this report?). No desserts. And though they do carry some Georgian sodas, including the infamous Tarkhun, this restaurant is BYOB, so don’t forget to stop at a nearby liquor store (such as Golden Sands Liquors at 205 Neptune Ave) if you’re so inclined. 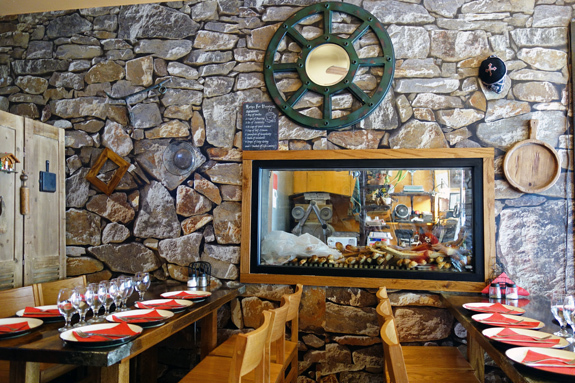 The food at Toné Café can be hit or miss. For all my criticism, the khachapuri are quite good (when you can get them). The kebabi and hot lobio are great. The khinkali and the shkmeruli might do for your dog, if your dog likes cilantro and garlic. Speed of service can also be hit or miss. More problematic is the dish availability. How hard is it to update a menu printed on a piece of paper? Or, if this is still too much effort, to get a blackboard (maybe instead of that stupid “recipe for happiness” hanging on the wall)? It pisses me off to spend three hours in transportation to be told that “there’s no khachapuri today”. Sometimes disingenuously so, on top of that — I remember once seeing two supposedly 86’d breads in the counter section! How can this place possibly be on Seamless? What do they do when half of the food their web customers order is unavailable? If the cook doesn’t feel like turning out khachapuri 7 days a week for lunch and dinner, I would politely suggest they either find an additional cook or close the restaurant for certain meals. 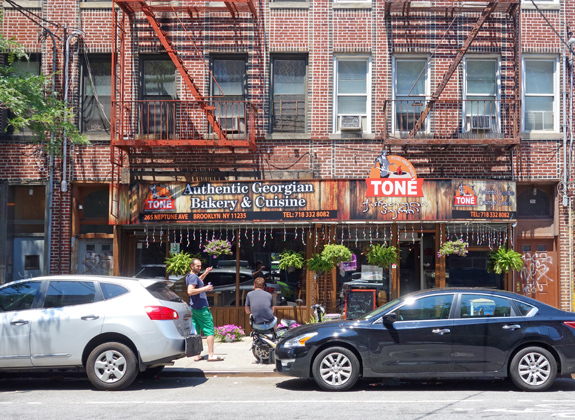 Unless you live in Brighton Beach, my recommendation to prospective patrons of Toné Café would be to go eat khachapuri at one of the now-plentiful Georgian joints in Manhattan instead: they’re likely closer, arguably better, and definitely more reliable. 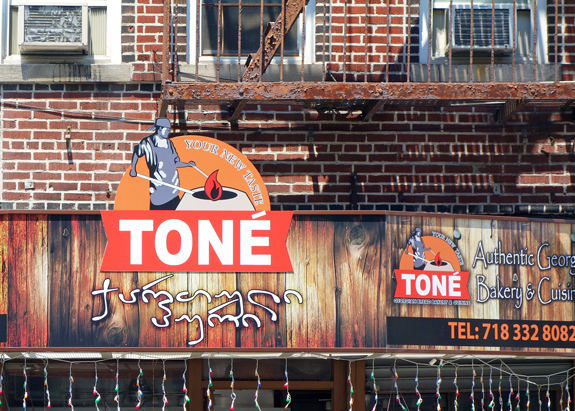 And hey, Toné Café, if you ever make that achma, send a delivery boy to bring me a piece! Really? What’s your favorite place in Brighton Beach?